Israel: The happy little country that can. As Yom Haatzmaut (Israel Independence Day) celebrations were winding down Tuesday night, Prime Minister Binyamin Netanyahu made a guest appearance on Channel 2's left-wing satire show Eretz Nehederet. One of the final questions that the show's host Eyal Kitzis asked the premier was how he would like to be remembered after he leaves office. Netanyahu thought a moment and said, "I'd like to be remembered as the leader who preserved Israel's security." On the face of it, Netanyahu's stated aspiration might seem dull. In a year he'll be the longest serving prime minister in Israel's history, and all he wants is to preserve our national security? Why is he aiming so low? And yet, the studio audience reacted to Netanyahu's modest goal with a thunderclap of applause. After pausing to gather his thoughts, a clearly befuddled Kitzis mumbled something along the lines of, "Well, if you manage to make peace as well, we wouldn't object." The disparity between the audience's exultation and Kitzis's shocked disappointment at Netanyahu's answer exposed — yet again — the yawning gap between the mainstream Israeli view of the world, and that shared by members of our elite class. The Israeli public gave our elites the opportunity to try out their peace fantasies in the 1990s. We gave their peace a chance and got repaid with massive terror and international isolation. We are not interested in repeating the experience. We will be nice to leftists, if they are polite. We might even watch their shows, if there's nothing else on or they are mildly entertaining. But we won't listen to them anymore. This is why US President Barack Obama's visit to Israel last month had no impact on public opinion or government policy. Obama came, hugged Netanyahu and showered us with love just like Bill Clinton did back in the roaring 90s. He praised us to high heaven and told us he has our back. And then he told us we should force our leaders to give Jerusalem, Judea and Samaria to our sworn enemies even as they teach their children to aspire to kill our children. And we smiled and wished him a pleasant flight home. Obama had no idea what he was getting into when he came here. Like Kitzis and his colleagues on Channel 2, Obama surrounds himself with people who like him, prefer fantasy to reality. In Obama's world, Islamic jihad is about the West, not about jihadists. In Obama's world, the most pressing issue on the international agenda is apartments for Jews in Jerusalem and Efrat. 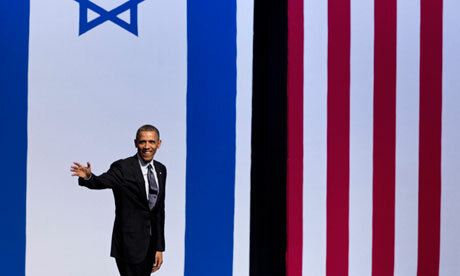 And in Obama's world, what Israelis need more than anything else is for leftist Europeans to love us. But a lot has changed since the 1990s. Twenty years after Yitzhak Rabin shook Yassir Arafat's hand on the White House lawn and so officially ushered in Israel's Age of Terror, most Israelis don't really care what the Europeans or the Arabs think of us. The Europeans prattle on about Israeli racism, and threaten to put yellow stars or some other nasty mark on Israeli goods. They ban Israeli books from their libraries in Scotland. They boycott Israeli universities, professors and students in England. In Italy they hold rallies for convicted mass murderer Marwan Barghouti at their national Senate. And in France they butcher Jewish children. And then the likes of Catherine Ashton expect us to care what they think about us. Well, we don't. For their part, Americans are bemoaning the resignation of the unelected Palestinian Prime Minister Salam Fayyad, and insisting that he was a true partner for Israel, who just couldn't make a go of it due to forces beyond his control. While most recognize Fayyad's departure has nothing to do with Israel, some US pontificators have blamed Israel for Fayyad's failure. Elliott Abrams for instance wrote, "Israeli governments also gave him less cooperation than he deserved." To that we answer, Fayyad was nothing more than a Western delusion, like Arab peace with Israel. Fayyad didn't have a chance of leading the Palestinians because he never personally killed a Jew. And the Palestinians only accept murderers as their leaders. But the fact that he never killed a Jew personally didn't render Fayyad a partner for Israel. Fayyad dutifully used donor funds to pay the salaries of terrorists in Judea, Samaria and Gaza every month. He led the Palestinian branch of the boycott, divestment and sanctions war against Israel. He made working for Israelis and buying Israeli goods criminal offenses. Fayyad personally led raids into private homes to inspect people's refrigerators to see if they had Israeli cottage cheese on their shelves. He organized and attended bonfires where they burned Israeli goods. Not to put too fine a point on it, but this is not the sort of behavior you would expect a peace partner to engage in. The Americans who insist on mourning Fayyad's departure refuse to accept the obvious fact that Palestinian aspirations for statehood are a cheap, shoddy, for-export-only Arab product. The Palestinians don't want a state. They want to destroy Israel. Unable to accept this basic fact, the Americans invent lies like Fayyad-as-peace partner and try to shove them down Israel's throats. Well good riddance Salam Fayyad. Obviously Fayyad is not the last word in Western delusion. They will think of a new perfect solution to replace him in short order. But in their endless search for the next silver bullet, the Europeans and the Americans and their Israeli followers miss the fact that the easiest way to build a secure and peaceful world is not by wooing terrorists. The best way to achieve these goals is by accepting the world as it is. This is what the Israeli people have done. True, we needed to have our fantasies blown away in suicide bombings before we reconciled ourselves to this simple truth. But life has been better, happier and more secure since we did. The "international community's" inability to accept that sober-minded contentment is better than pipe dream fantasies has caused leftist writers in Israel, Europe and the US alike to express mystification at a recent survey carried out by the OECD, which ranks Israelis among the happiest people in the world. The ranking made no sense to commentators. Israelis work harder than other members of the OECD. We complain more than other members of the OECD. We don't have "peace." And yet, we are among the happiest people in the OECD. For decades before we embarked on the phony peace process, Israel was a model socialist state. We had paralyzing tax rates and failed government industries that crowded private entrepreneurship out of the market. Monopolies ran every sector and provided shoddy goods and horrible services at astronomical prices. The Histadrut labor union owned most of the economy along with the government and in every sector, Histadrut commissars ensured that anyone with an ounce of initiative was subject to unending abuse. Just around the time we began extricating ourselves from our socialist straitjacket, we were also recognizing that the peace thing wasn't everything it was cracked up to be. And at that point we began to understand that happiness and success aren't about what other people give you — money, treaties, a phone line after a five year wait. Happiness and success are about what you accomplish. At that point, sometime between 1996 and 2000, Israelis began creating large families and embracing the free market. Today, with an average of three children per family, Israelis are the fecund outliers of the industrial world. And as David Goldman at PJ Media has demonstrated, there is a direct correlation between children and human happiness. This is why fruitful Israelis have the lowest suicide rate in the industrial world. When you have children, you have a future. And when you have a future, you work hard to secure it, and have a generally optimistic outlook. What could be so bad when your kid just lost his first tooth? Israelis are also happy because we see that we can build the future we want for our families and our country even without another glitzy signing ceremony at the White House every six months. Our country is getting stronger and more livable every day. And we know it. Those on the international stage that share our view that life is about more than pieces of paper signed with Arab anti-Semites recognize what is happening. For them Israel is not "that shi**y little country." It's "The Little Engine that Could." Take the Chinese. Last July China signed a deal with Israel to build an inland port in Eilat and a 180 km freight railway to connect Eilat to Israel's Mediterranean ports in Ashdod and Haifa. The purpose of the project is to build an alternative to the Suez Canal, in Israel. The Chinese look at the region, and they see that Egypt is a failed state that can't even afford its wheat imports. The future of shipping along the Suez Canal is in doubt with riots in Port Said and Suez occurring on a regular basis. On the other hand, Israel is a stable, prosperous, successful democracy that keeps moving from strength to strength. When the freight line is completed, as far as the global economy is concerned, Israel will become the most strategically important country in the region. Then there is our newfound energy wealth. Israel became energy independent on March 30, when the Tamar offshore gas field began pumping natural gas to Israel. In two to three years, when the Leviathan gas field comes online, Israel will become one of the most important producers of natural gas in the world. Moreover, in 2017, Israel will likely begin extracting commercial quantities of oil from its massive oil shale deposits in the Shfela Basin by Beit Shemesh. Geologists assess that the field alone contains some 250 billion barrels of oil, giving Israel oil parity with Saudi Arabia. Chinese, Russian and Australian firms are lining up to sign contracts with Israeli energy companies. International analysts assess that Israel's emergence as an energy power will have a stabilizing impact on the global economy and international security. Israel can end Asia's oil and gas hunger. It can reduce European dependence on Russia. It will remove OPEC's ability to dictate world oil prices through supply manipulation. Israel's discovery of its energy riches couldn't have come at a more propitious time. Had Israel discovered its oil and gas 65 or even 20 years ago, we wouldn't have had the economic maturity to manage our resources responsibly. But now, with our free market, our high-tech sector, and our entrepreneurial culture, we can develop and manage our resources wisely and successfully. At 65, Israel is becoming a mature, responsible, prosperous and powerful player in the international arena. The only thing we need to ensure that we enjoy the fruits of our labors is security. And the one thing we can do to squander it all is place our hopes in "peace." And so we won't, ever again.